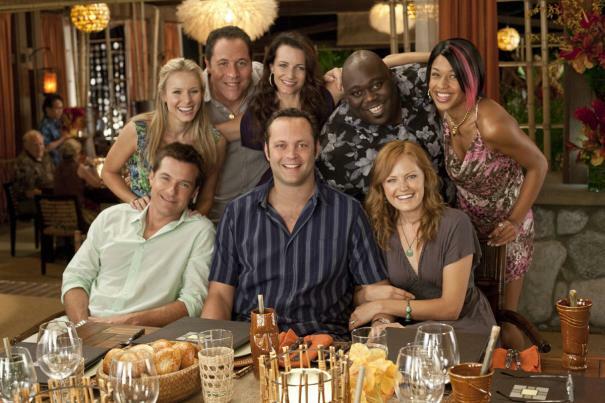 Vince Vaughn, Jason Bateman, Jon Favreau, Malin Akerman, Kristin Davis, Kristen Bell and Faizon Love star in Universal Pictures' upcoming comedy "Couples Retreat." Based on an original idea of Vaughn's, the comedy follows four Midwestern couples who embark on a journey to a tropical island resort. While one of the couples is there to work on their marriage, the other three set out to jet ski, spa and enjoy some fun in the sun. They soon discover that participation in the resort’s couples therapy is not optional. Suddenly, their group-rate vacation comes at a price. What follows is a hilarious look at real world problems faced by all couples. The film also stars Kali Hawk and Jean Reno.